Stylish and Functional Cocktail Tables with Stools! *Check out these Stylish, Modern and Functional Cocktail and Coffee Tables with Stools Underneath! The true purpose of a cocktail or coffee table is to serve drinks, coffee, tea and snacks right? Imagine having a beautiful and very stylish cocktail table that comes with cute stools underneath? They are perfect for entertaining a few guests! No more having to reach all the way to the coffee table from the couch, afraid you are going to drop something on the carpet and make a mess! I found a few of the cutest, most stylish and definitely very modern and practical cocktail tables and coffee tables with stools! 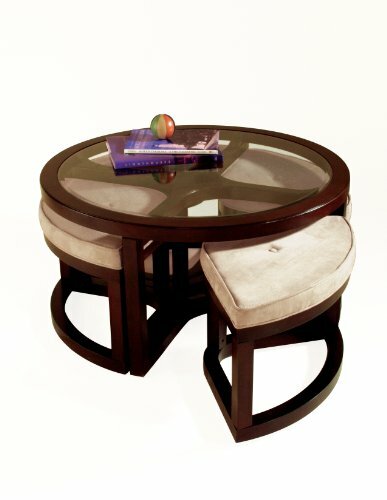 *This one is a beautiful wooden round cocktail table with a glass top and 4 cute stools underneath! Will get you compliments all the time when you have guests! The stools are conveniently ‘hidden’ nested under the table and when you need the extra-seating, voila! Each ottoman has a nice and comfy dark brown faux leather upholstery. Will look great in the living-room, specially if you also have a dark brown leather sofa set! This is a gorgeous and very practical round cocktail table that lifts up and also has 4 beautiful and convenient ottomans underneath that can serve not only for storage, but also for extra-seating. It also has a beautiful dark brown color, which goes well with everything, specially white, chocolate brown and beige! When you are done using it, the four ottomans will fit perfectly underneath! 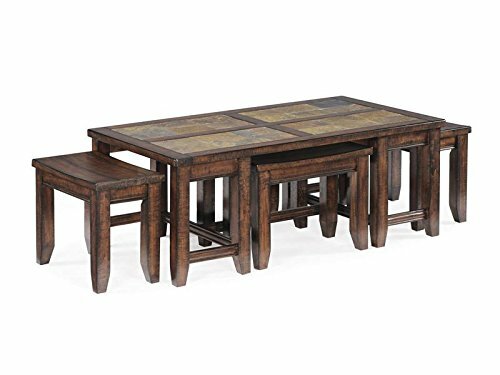 This is a very unique and sort of ‘rustic looking’ wooden rectangular large cocktail table that comes with 4 handy stools underneath. It has a beautiful ‘cinnamon finish’ too! Perfect for entertaining your guests and even dining if you want! I really like the cool texture, color and details! Stunning Asian Style Mother of Pearl Round Cocktail Table with 4 Stools! 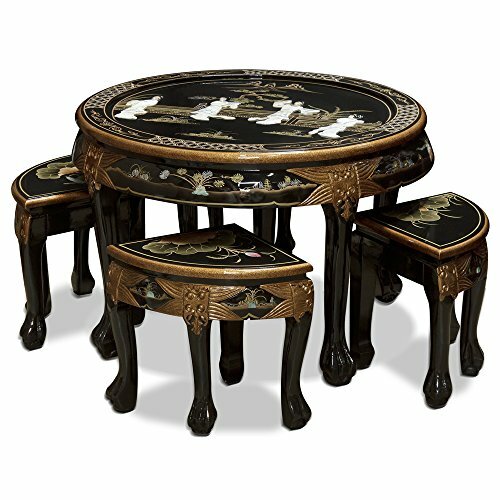 This is the most beautiful Asian style cocktail table with stools underneath ever created! The classic courtyard scenery design is gorgeous! It was all hand-painted on hardwood. 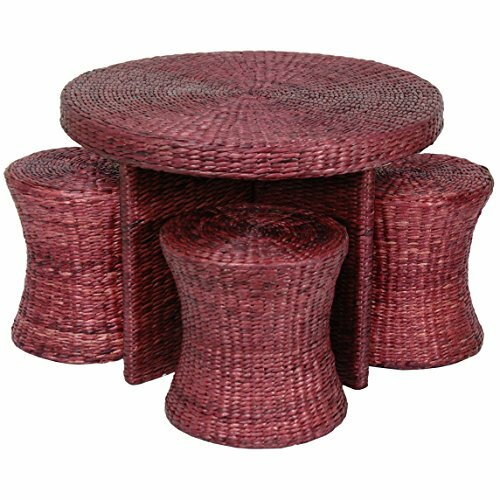 Gorgeous Natural Fiber Rattan Style Round Coffee Tables with Four Stools! 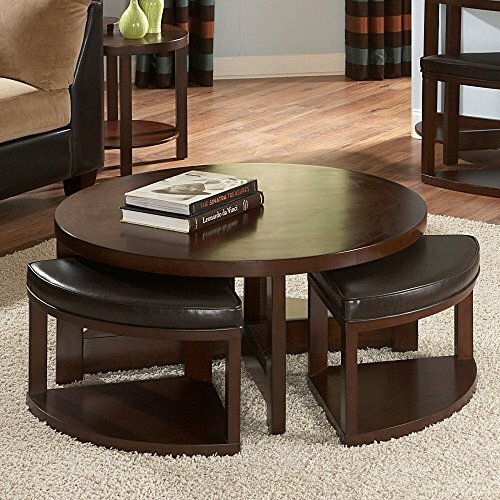 I fell in love with this cute rattan style round coffee table with stools when I saw it! Perfect to have in your porch or in your beach house! They are super lightweight and easy to move around! 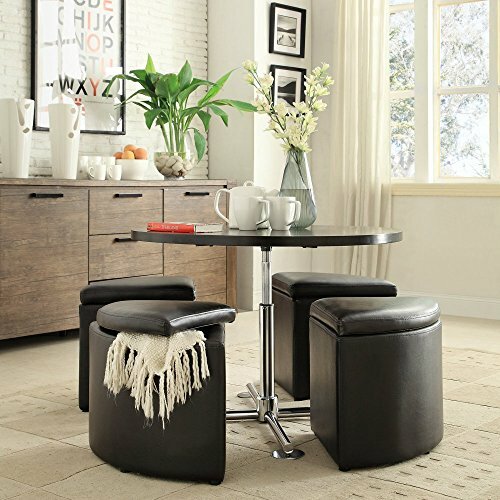 I love this stylish espresso color leather coffee table with two cute storage stools that also has a handy magazine rack! Perfect for enjoying your favorite photography books while sipping a nice glass of wine! 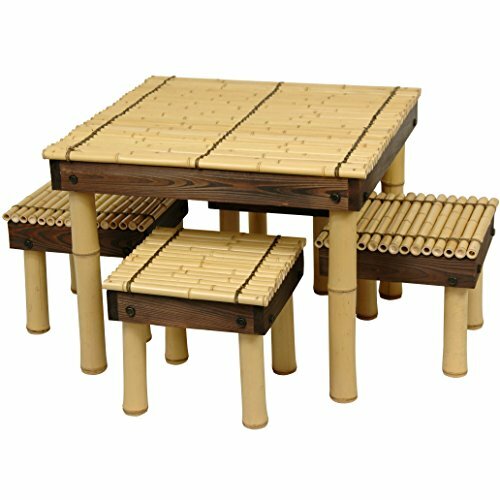 This is by far the cutest bamboo coffee table with stools I’ve ever seen! It is my favorite from this page!